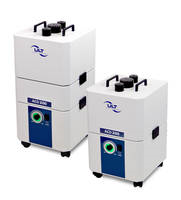 The ULT 200.1 series from ULT LLC is for the removal of laser and soldering fumes, dusts, gases, odors and vapors. The fume extraction systems’ modularity provides high flexibility regarding changing process conditions. The devices can be individually equipped with different filter units, such as for higher pollutant amounts or with activated carbon as needed. Users can assemble each system with a variable number of capturing elements, such as extraction arms or hoses. Specially developed integrated vacuum stabilization and selectable pressure ranges are also featured.